Super Savvy Mommy: In The Nick of Time Review and GIVEAWAY! In The Nick of Time Review and GIVEAWAY! I have always loved all music but Rock and R&B really are my true loves. Anyone who knows me knows that children's music is not something you would have found on my ipod. That is, until now. Coconut Groove not only is catchy and hip but it has the perfect balance of silliness and educational lyrics. I am hooked. Dexter, being only 1, from what I can tell, loves this CD more than Beyonce's Single Lady (his favorite song to date). Nick's musical training began at an early age. Over the course of 25 years, he became a multi-instrumentalist playing guitar, bass, banjo, piano, ukulele, harmonica, saxophone, percussion and hand drums. He received a B.F.A. from Bates College with a concentration in Jazz Composition, followed by a Master's degree in Media Writing and Music Production from the University of Miami. Nick formed In The Nick of Time Music in 2001 to promote and distribute his kids' music. It has grown to produce music and media for all forms of entertainment from web-music and independent film scores, to Broadway sound design, and record production. Nick's career as an educator begin in 2000. While working at the LEAP school in Lexington, MA as a music specialist, Nick became certified by the Department of Education to teach preschool, and has been developing an original music curriculum for Pre-K through 5th grade. In 2006, Nick was honored by the Academy of Television Arts and Sciences for his dedication to children’s music with the prestigious Fred Rogers Memorial Scholarship. 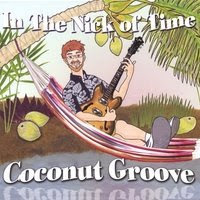 How would you like the opportunity to win a copy of Coconut Groove SIGNED by Nick himself?! I thought so, all you have to do is head over HERE and find your favorite song. Then come back here and tell me which song you liked the best. You HAVE TO leave your email address in order to be eligible. This fantastic contest will end on March 30th at Noon EST. I will email the winner and you will have 48 hours to get back to me before I choose another winner. I like the dinosaur song, but all his songs are great! I like the autumn song best, thanks!